Purchase online in India Development Board for STM32F103C8T6 ARM Microcontroller at low cost from DNA Technology,Nashik. This board is low cost Minimum System Development Board for ARM Microcontroller – STM32F103C8T6. Board is suitable for learners that want to learn STM32 microcontroller with ARM Coretex-M3 32-bit core. 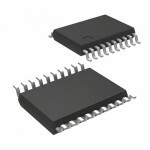 STM32F0308 Value Line Discovery BoardThe 32F0308 DISCOVERY helps you to discover the STM32 F0 Value ..
STM32F0308 Value Line Nucleo BoardThe STM32 Nucleo board provides an affordable and flexible way for..
STM8S003F3P6TR MicrocontrollerThe STM8S003F3/K3 value line 8-bit micro-controllers offer 8 Kbytes of..